Gourd Plant , Grass Fibre Plant , Resin Plant? , Wax ? L = 94.5, embouchure diam ext. = 35.5 x 35.6, diam int. = 19 x 27; finger-hole diam = 5, suspension hole diam = 1.5, suspension loop L = 180, W = 1.5 mm [RTS 2/9/2005]. Small notched end-blown flute cut from the top part of a gourd that has been dried. This consists of of an oval embouchure, 'notched' or cut to form concave front and back edges, with traces of a dark brown resinous or waxy substance that has been added to narrow the embouchure and guide the breath. Below this, the body follows the natural curve of the plant, tapering in towards a circular finger-hole at the distal end. 2 finger-holes have been cut into the front; the upper hole has been subsequently plugged with the same material used to narrow the embouchure. A piece of twisted fibre cord has been doubled over the lower part of the body and knotted, while a second piece extends vertically up the side towards the embouchure, passing through 2 small holes bored into the gourd wall just below the lip, then back down the same side to be secured with a knot. This string is obscured on the interior by the waxy material, which must have been added afterwards. A carrying or suspension loop has been tied onto this vertical piece, made from a similar yellow 2-ply cord of twisted grass fibre (Pantone 7509C). It may be that the original loop was secured to the instrument in a different way, as there is a second pair of holes immediately below the first; these are now plugged up with resin or wax. All the holes have burnt edges, suggesting that they were made using a heated tool, and there are a few black 'spots' around the surface where it seems to have been randomly applied. The surface is a deep orange colour (Pantone 723C). The object is complete, with a weight of 9.9 grams. It has a length of 94.5 mm, with an embouchure that measures 35.5 by 35.6 mm across its outside edges, and 19 by 27 mm across the inside opening, while the finger-holes have a diameter of 5 mm, and the suspension holes a diameter of 1.5 mm. The suspension loop is 180 mm long, with a width of 1.5 mm. Collected by Percy Horace Gordon Powell-Cotton and his wife Hannah at Logoforok on 16th February 1933 during a shooting expedition. Powell-Cotton gives the (Eastern Nilotic) Lango term for this object as lalego. Driberg lists several other words for wind-blown instruments used by the Western Nilotic Lango, including bilo, olwet, olere, alugturu, amule, and otule. None seem to correspond with this particular type ( J.H. Driberg, 1923, The Lango, p. 424. For a similar flute cut from the end of a gourd, see 1979.20.193; this is associated with the Southern Larim and has a single finger-hole at side and another at its distal end; Langton describes this as a hunting whistle, and says that it was used by both men and boys, and was played by alternating the fingers on the upper hole, while the hole at the base is always kept covered. Gourd tops are also used for flutes by the Labwor and Madi of Uganda, both being of similar length to this example, and also by the Acholi (M. Trowell & K.P. Wachsmann, Tribal Crafts of Uganda, 1953, pp 343-344). Accession Book Entry [p. 248] 1934 [insert] 8 [end insert] - MAJOR P. H. G. POWELL-COTTON , Quex Park, Birchington, E. Kent. Specimens collected by himself & Mrs Cotton, during hunting trips, 1933, viz: [...] [p. 256] - From the LANGO tribe, LOKOFOROK, LOMULENG & LOMO. [insert] 97 [end insert] - Lalego , notched whistle made from the end of a gourd, mouthpiece shaped with gum, 2 lateral stops (one plugged up) and one terminal. ib[idem] [LOKOFOROK] (327. Additional accession book entry [p. 257] - 1934.8.97. Number given HLR, l[ength] = 9.5 cms, diam[eter]. 3.6 cms. Card Catalogue Entry - There is no further information on the tribes catalogue card [RTS 24/5/2004]. Pitt Rivers Museum label - Lalego , end-whistle. LANGO. LOKOFOROK, E. SUDAN. d.d. Major Powell-Cotton, 1934. 3 47° N., 33° 5' E. (327) [small paper tag, tied to object; RTS 2/9/2005]. Related Documents File - Typewritten List of "Curios Presented to Dr. Balfour by Major & Mrs. Powell-Cotton. Lango Tribe". 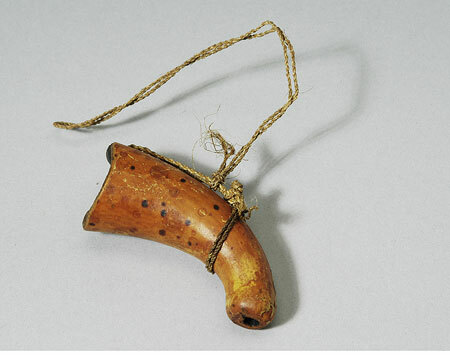 This object appears as item 327: "Gourd musical whistle with fibre string attached, native name Lalego , 16/2/33 Lokoforok, 3. 47 N 33.5 E”. Also contains details of a cine film 'some tribes of the Southern Sudan', taken by Powell-Cotton during this 1933 expedition, copies of which are now in the National Film and Television Archive and the Powell-Cotton Museum in Kent [RTS 14/3/2005]. Sparks, Rachael. "Lango flute" Southern Sudan Project (in development). 03 Jan. 2006. Pitt Rivers Museum. <http://southernsudan.prm.ox.ac.uk/details/1934.8.97/>.